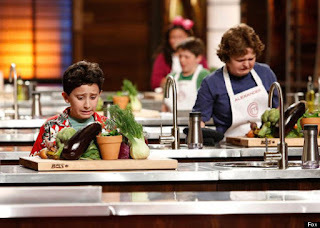 If you've spent your Saturdays binge-watching "MasterChef Junior," you're not alone. 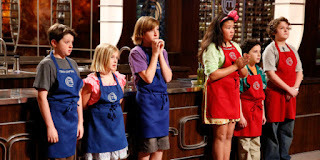 Fox's spinoff cooking competition for kids ages 8-13 became one of fall TV's sleeper hits, gaining attention from news outlets, famed chefs and families obsessed with their DVR. Set up just like "MasterChef," the "Junior" edition calls on kids to cook Beef Wellington, layer cakes and soft-boiled eggs for the same judges as their adult counterparts. Plus, the winner will receive $100,000 and a huge trophy (which, we should mention, excited the contestants way more than the money). 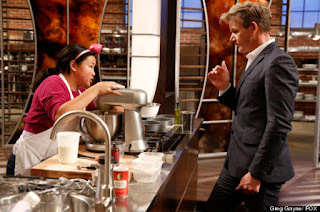 But after watching all six aired episodes in one fell swoop -- the finale airs tomorrow (Nov. 8) -- we were left with so many questions about how the show actually works: How do you throw a 9-year-old into the kitchen with hothead Gordon Ramsay? Did that kid from East Rockaway actually make a perfect roulade ... and then get eliminated? What about knife cuts and boiling water burns? We caught up with showrunnner and executive producer of "MasterChef" and "MasterChef Junior" Robin Ashbrook, who answered all of these questions and more as we get ready for the season finale of "MasterChef Junior." "We did outreach in the most obvious of places, primarily from cooking schools and classes, and normal schools. I'd have to look but of the kids that made the final -- let's say 10 -- I certainly don't think 10 of them had cooking lessons. Probably half had." "As a late pick-up from Fox, we actually physically sat and did casting sessions in two cities, New York and Los Angeles. Gavin came down from San Francisco and some kids came in from the Midwest. My intention and hope is that for any future seasons, we’ll cast much wider. If we get these kids from the coasts, I’m excited to see what we can get from Denver, Kansas City and New Orleans." "The three judges are all fathers of children in this age range. They instantly know how to communicate with the kids. In the kitchen takeover Gordon was very direct with some of the kids, but at the same time it was so natural for the three guys to be very nurturing. But also, when you see these kids listening to Gordon and Joe, their minds are like sponges because they’re used to being in school five days a week. They just soaked up so much more information than the adults." "I remember on day one we did the audition and the judges were like, 'How are we going to be? This food is not going to be as good as the adults’ so how do we approach it?' They just assumed the food would be fish fingers or beans on toast. Once some of those first plates got put in front of them on the audition episodes, the judges would have the same reaction that the audience has: 'Oh s--t, can they really do this?'" "The season took almost three weeks to film. Right by the kitchen we have classrooms so they fulfilled all their mandatory classes. For us, production-wise, it was a challenge because we usually film on the grown 'MasterChef' a 12-hour day. With these guys, depending on which day of the week, and their age, the limit is just four hours a day. When those four hours are up, those four hours are up. We literally had to stop filming." "There was always a chaperone and it was almost always a parent. They were at all times able to see what was going on in the kitchen. All of the parents actually sat together and watched what happened. They really bonded. It certainly wasn’t a 'Dance Moms' atmosphere." "Every one of the rows has a medic right at the end of it that you rarely see. He has his or her eyes on one kid at all time. There’s no such thing as rubber knives and pretend boiling water on this show. If it’s real, it’s real. If we’re saying to America that these kids can cook these incredible dishes, there’s no reason to stand down and swap out water with trickery." "Like all reality shows -- there’s no secret -- we take it very seriously how people will feel, so there’s always a debriefing. I walked on the set when Jack lost. I love him and his family and I was like, 'Jack it’s okay.' This is two minutes after he got eliminated and he’s like, 'It’s okay! It’s great. I’m going to see my dad and play with my dog! With the grown-ups it’s like, 'What does this mean for my future?' The kids would be like, 'I made some great friends, see you later, Robin!' The bounce-back-ability is so beyond that of adults." "None of these kids came knowing there was a prize. When we were out looking for these kids we didn't say, 'Hey, you could win this.' It was like, 'This sounds fun.'" "They were things they brought with them. But Joe in reality had this whole conversation with Jack about playing poker and Hawaiian shirts. In reality, it went on for a long time. He probably had two or three Hawaiian shirts with him. But it became a thing for him. These kids don’t need stylists." "I think we’ve only scratched the surface. We want kids from very different social backgrounds and very different places. So, I’m excited to dig deeper and pull more people in next time around. The show is more successful when there are more kids making crepes with their dads because they’re watching shows like this." "Favorites like Jack and Sarah have a presence in the finale. The cooking is not plain sailing; it’s tough for those kids. This is not sugar-coated Disney cooking. There are ups and downs for them that make for a very stressful 42 minutes on the edge of your seat."